How do you compare the good that the UK is doing with its whopping 0.7% aid budget, against the good that Germany is doing by accepting large numbers of refugees? A smart (German) friend asked me if there are any numbers on the size of the remittances we might expect to see from Syrian refugees in Germany to Syria. 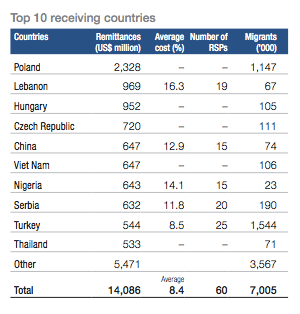 Of course, remittances are far from the most important reason for accepting refugees, but they do allow for a nice easy cash sum with which we can make a comparison to aid flows. The UK is spending somewhere between £200 million and £400 million on Syria this year. For comparison, whilst Germany is ramping up aid spending, it is still less than 0.4% of GDP overall. But in terms of numbers of refugees, Germany expects to take 800,000 this year (compared to just a few thousand in the UK), though fewer than that have been documented so far, and not all will be Syrian. Let’s assume for a moment that the total will be 400,000 from Syria, and they will be quickly processed so that they are able to work. If every Syrian refugee in Germany was able to send home £1,000 to family and friends, that already equal Britain’s aid budget for Syria. Is £1,000 a realistic prospect? One way to think about this is to look at remittances from existing migrants in Germany (p33) to the middle east. There are currently around 67,000 migrants from Lebanon living in Germany, who send back to Lebanon almost $1 billion a year - that’s around £9,500 each, which seems almost implausibly large, but who knows, the Chinese and Vietnamese also send home large sums, and the Nigerians send home even more. In any case, it certainly seems plausible, even likely, that Syrian refugees to Germany, once permitted to work for even low German salaries, will be able to send home at least £1,000, if not more.